Bone grafting for dental implants is a common surgical procedure performed by Pacific Oral Surgeons to augment, or build up, the jawbone in order for the implants to be successfully placed. Bone grafting is an oral surgery procedure used in patients whose jawbones are insufficient in either height or width to support dental implants. Because the only function of the alveolar bone in the jaw is to support the teeth, the body quickly begins resorption of the bone if teeth are missing. Without an adequate amount of jawbone, dental implants cannot be placed. 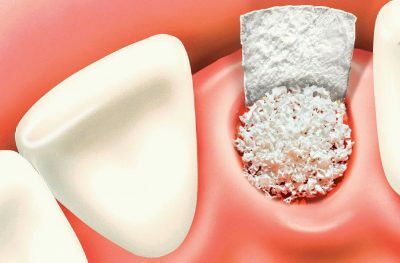 Bone grafting is performed as an in-office procedure, often as an integral step in the dental implants process. While some bone grafting is done using the patient’s own bone (autogenous grafts), oftentimes the bone is augmented using processed bone harvested from animals (usually cows). This bovine bone (xenograft) has all the organic materials removed, is sterilized, and is made up of only the bone’s mineral content. It is used to hold the surrounding oral tissues in place until the body biochemically reacts to the graft, resorbing it and replacing it with natural bone (guided tissue regeneration). Some patients do require extensive autogenous bone grafts, which involve harvesting bone from the hip or shin. These bone-grafting procedures typically require hospitalization. 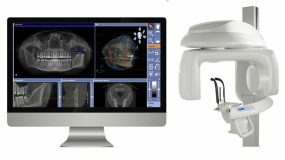 Pacific Oral Surgery, when indicated, will use latest advanced technology computer guided dental implant surgery for replacement of teeth with dental implants. Most often, simpler outpatient surgeries can be utilized to prepare the mouth for dental implants. Your oral surgeon may use a combination of bone grafts to get the optimal result from your dental implant treatment plan. 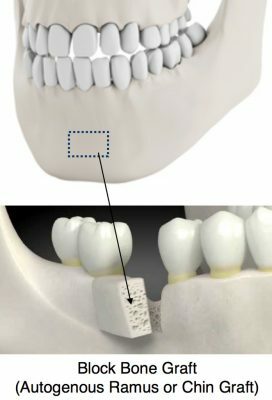 A socket bone graft or ridge preservation graft is typically used for cases in which a dental implant cannot be placed at the time of tooth extraction. This delay frequently occurs due to dental infection or a discrepancy between the size of the extracted tooth and the implant replacement. The ridge graft preserves the space while the bone naturally proliferates and fills the void. The socket bone graft usually requires 3-6 months of healing/fusing time before the implant can be placed. 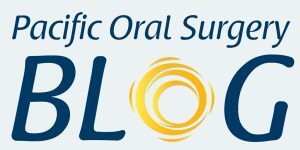 A socket bone graft, or alveolar ridge preservation graft, is a bone grafting procedure performed by the Pacific Oral Surgeons. 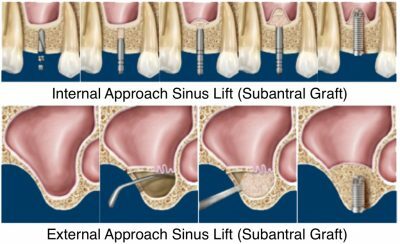 A sinus lift, or subantral graft, is utilized for cases in which there is not enough upper jawbone between the maxillary sinus and the oral cavity for implants to be securely placed. During the subantral bone graft, the surgeon makes a small window-like opening in the sinus and fills the space with the bone graft material while leaving the sinus membrane intact. This grafting process builds the height of the upper jaw, forming a platform for the natural bone replacement. Immediate dental implant placement: Dental implants can be placed at the time of the bone subantral graft if the natural bone present is over 5 millimeters. This bone then consolidates around the implant, thus eliminating a surgical step later and shortening the length of the dental implant process. A 4-6 month healing period is typical before the prosthetic teeth can be integrated. Delayed dental implant placement: When the existing jawbone is less than 5 millimeters at the time the sinus lift is performed, the dental implant will need to be placed during a separate procedure. This happens after the bone graft for dental implants has consolidated, usually several months later. After the implant has integrated, the replacement teeth can be put on. A block bone graft is a procedure in which the patient’s own bone is harvested (autogenous graft) to replace the deficient area of the jawbone. A block graft is used when bovine bone will not provide sufficient bulk or replace the bone adequately. Typically, a block of bone (approximately 1 square inch) from the lower jaw where the wisdom teeth are located (mandibular ramus) or the chin is used for this graft. A section of bone is removed and transferred to the area of deficiency and then the surgery site is closed. The graft usually requires about 4 months to fuse with existing jawbone, at which time the implant can be placed. 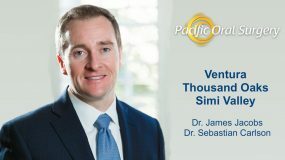 At Pacific Oral Surgery, oral and maxillofacial surgeons, Drs. James Jacobs, John Webb, and Sebastian Carlson perform all manners of bone grafting surgery. Many bone grafting procedures utilize local anesthesia or IV sedation in a comfortable outpatient setting. Through the use of advanced technologies, bone grafting has become an innovative option which enables many more patients to enjoy the benefits of dental implants. If you have questions concerning bone grafting or are interested in finding out more about the bone grafting procedures available to you, contact our office for a consultation. 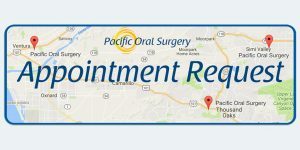 Please submit an online appointment request or call one of our Pacific Oral Surgery offices located in Ventura, Thousand Oaks and Simi Valley.